Flowcharts, along with their decision-table siblings, guide a person through choices, evaluations, or decisions. 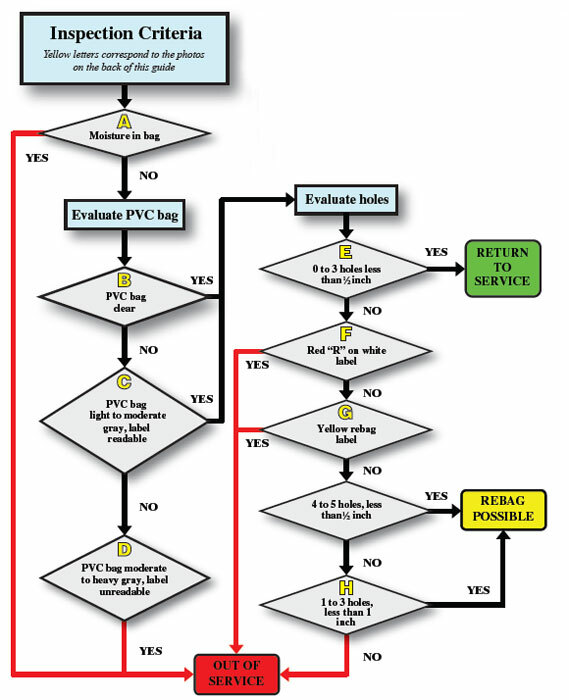 As an example of a flowchart, I’m using inspection guidelines for a personal fire shelter. The guidelines come from the USDA Forest Service website (specifically, Fire Shelter Inspection Guide and Rebag Direction). 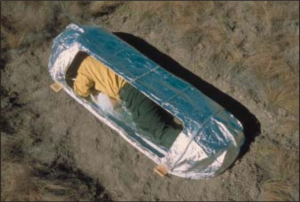 A fire shelter is a last-ditch, personal-protection device, meant to radiate heat away from a firefighter who’s been trapped by a fire. The shelter’s pup-tent shape encloses air for the fighter to breath as the fire passes over. Firefighters receive a fire shelter as part of their equipment, and one of their responsibilities is to inspect it regularly. That’s what the guidelines are for. The second photo shows what a fire shelter looks like in its bag. 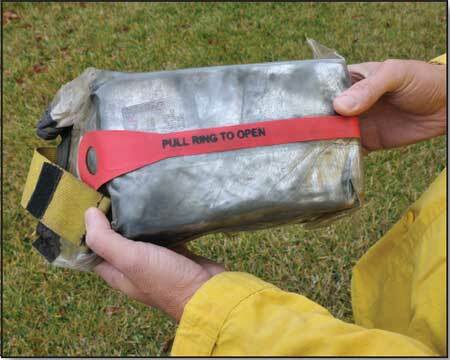 Firefighters leave the bag closed until they have to deploy it, which explains the need to inspect the bag regularly. There’s more to the guide than appears below; I’m just highlighting its flowchart. Which is a good excuse for me to point out that most job aids are combinations of techniques–for example, step-by-step instructions (a cookbook) combined with decision guidance (like a flowchart). A Forest Service firefighter or a person with similar responsibilities. While you could use this to help inspect any fire shelter, the language in the guide implies that you’re inspecting your own. What’s the task being guided? Determining whether a fire shelter has any defects that would render it unsafe. Is there moisture in the bag? What’s the status of the bag itself? Are there holes? How many, and what size? Does it have a label with a red R? Does it have a yellow rebag label? I want to emphasize, because of the nature of the task, that the full guide has a number of photo examples (e.g., this is what a label with a red R looks like).